We would like to thank Shane Mitchell and the Walkerville neighborhood of Windsor, Ontario, for their hospitality and generous donations to Strong Towns last week. We really appreciate the opportunity to share the Strong Towns message with you and look forward to seeing the change you help bring about. If you would like to support our efforts to spread this important message, please consider making a donation today. This past weekend I came across a video of a fellow named Stanley Kurtz. I had heard a little about him this summer when his book, Spreading the Wealth: How Obama is Robbing the Suburbs to Pay for Cities, was released. I must admit that I found the notion so absurd that I essentially ignored it. 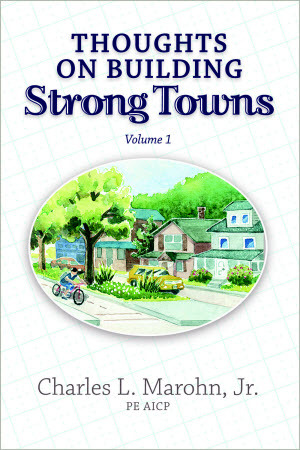 The thesis conveyed in the title is ridiculous and you don't have to be a reader Strong Towns to know that. Anyone who has worked in or seriously looked at the budget of a suburb would understand. Suburbs have the near-term illusion of wealth, but long-term, core cities are vastly more productive. Growth in the suburbs has always meant increasing taxes and government for those places -- not less as the Kurtz fantasy would somehow convey -- and that is even before the entire Ponzi scheme aspect of the second life cycle financially takes hold. To suggest that suburbs are wealthy and central cities are impoverished ignores the trajectory of these places. Go to nearly any American city and look at the first and second ring of automobile suburbs. You may find pockets of prosperity, but largely you find places in serious decline. The suburban action today is on the far edge, where the illusion of prosperity brought about by the first life cycle of suburban development still has yet to meet reality. As recent history shows us, give it time and it inevitably will. When I came across the Kurtz video, it struck me how neatly it fits with both sides of the secular religion that is the suburban/urban relationship. Suburban conservatives believe that their wealth is being confiscated to support transit systems and other urban living schemes. Many urban dwellers (our readers excluded) seem to believe this narrative as well, but cite the fairness of redistribution from the more fortunate to the less as the basis for the system. These belief systems fit nicely with the politics of our two major political parties, each of which benefits from having their constituents trapped within these falsehoods. For example, in the video, Kurtz cited the regional tax sharing of Minneapolis/St. Paul as a model for what liberals and others sympathetic to the benefits of wealth redistribution would seek to impose on the rest of the country. There are a couple of important things about that example. First, I think the underlying premise is largely true -- Republicans in our state would generally oppose the fiscal disparities revenue sharing as it is set up while our Democrat Farm Labor party would defend it to the last -- but second, the redistribution goes in the opposite direction most ideologues assume it does. The Minnesota Fiscal Disparities Act of 1971 was set up to share some of the tax revenue from new commercial and industrial expansion among local governments. The idea was that, as suburbs grew, they shouldn't try to steal all the tax base from the central cities and, if they did, some of that revenue should go back to sustain the urbanized areas. Here's the counterintuitive part: the money generally goes the other way. Areas that are established and developed -- particularly Minneapolis and Bloomington -- subsidize the small towns and rural areas on the periphery that are were trying to quickly suburbanize. Image taken from page 20 of the Study of the Metropolitan Area Fiscal Disparities Program. And that is just direct tax subsidy, it doesn't include the enormous subsidies of highway building, expansion of sewage treatment capacity and the over sizing of key trunk infrastructure to handle peripheral expansion, things like ramp meters that penalize urban dwellers to the benefit of suburban commuters, tax incentives like the home mortgage interest deduction and programs for development from FHA, Freddie, Fannie and HUD, which does not support productive mixed-use development. In each of these instances you generally have the small government Republicans decrying programs that largely benefit their constituents while, at the same time, activist government Democrats calling for more top down centralization and spending, an approach which is actually diminishing the resources of their constituent communities, places that are far more financially productive. As the Ponzi scheme finance of areas developed with the suburban model becomes untenable, the shift of investment capital from the periphery to urban areas that is currently underway will likely accelerate, making the urban subsidy of suburban areas even more pronounced. The work I have done in Memphis -- building on work done by Joe Minicozzi of Urban 3 -- affirms that insight on the micro scale. I sat with the Mayor of Memphis, A.C. Wharton, and explained to him how the poorest neighborhoods of the city were contributing more in taxes -- producing a far higher rate of return for the city -- than any of the neighborhoods built in the post World War II "growth" spurt. Yet the city and the region were spending the vast majority of their resources trying to induce more of the unproductive land use patterns on the outskirts of town. We now have the maps and data to back up those assertions (I will share those here soon). Mayor Wharton is not only a good man, but an intelligent one, so these revelations hit home hard. The hyper-partisan website Democratic Action Team had a rather glib, but insightful, graphic back in 2008 that demonstrated this insight nationally. 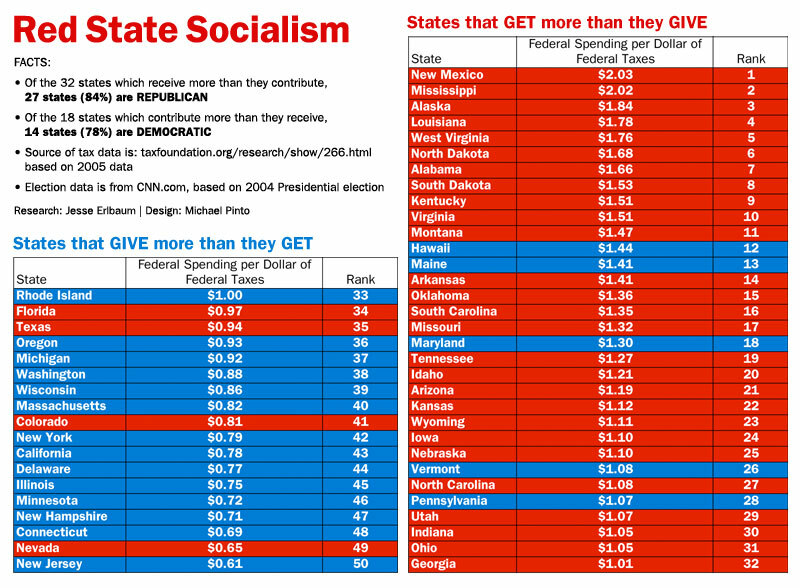 Using the color red to denote states that went Republican in the 2004 presidential race and blue those that went Democratic, they split states into two columns: those that pay more in federal support than they get in return and those that experience the opposite. At this point, there should be no big surprise how this analysis turned out. Click on the photo for a larger version on the original website. Some of us live in cities, angry at the SUV-driving commuters and their environmentally destructive lifestyle, not to mention their gun-toting, FOX news watching, church-going, small government inclinations. We're so upset with it all that we demand that taxes be raised to fund programs to address these ills, revenue that disproportionately comes from urban areas and is redirected to support the suburban lifestyle. Some of us live in suburbs, angry at the transit-loving urban folks and their condescending ways, not to mention their gun-hating, MSNBC-watching, big government inclinations. We're so upset that we demand an end to government programs and subsidies, a large portion of which are essential to the very lifestyle we live. To me this is bizarre. What is even more bizarre is how our politics feed into this. The only thing I could find on Mitt Romney's website dealing with infrastructure spending was on Amtrak. He wants to privatize it (kill it), of course. That we're trying to run a 19th Century transportation system with a 21st Century financial model (read: fraudulent, Ponzi accounting) is never discussed. Nowhere is the recognition that the productive land use patterns of the Northeast actually allows Amtrak to run a profit, that transit systems of all kinds are financially viable when a value capture mechanism is utilized to cover capital costs. The President's approach is just as frustrating. In the Great Depression, we used infrastructure projects to put people to work. Somehow, in an age of enormous machines that do the work of hundreds, where we have built out the extents of our infrastructure systems far beyond our capacity to productively utilize (let alone maintain) them, Obama's campaign still sells infrastructure as a jobs program. The call is for more money (alla the ASCE Infrastructure Cult) for more of the same, with a tiny shift in emphasis from white elephant highway projects to white elephant rail projects. The Ponzi scheme rolls on. Here's the ray of hope: I have met with public officials at the local level all across the country. I have met with countless state legislators and policy advisors. I have yet to meet a decision-maker (specifically, I'm referring to non-employees) that does not immediately grasp the Strong Towns message. I've found that it affirms something they intuitively know to be true -- that our current approach is not productive and their city is trapped in the late stages of a Ponzi scheme -- but that they have had a difficult time explaining to their constituents. Our national conversation will change soon because Republicans are going to have to reengage with urban areas. While the GOP, in true conservative spirit, will defend the current status quo of American suburban life, peripheral decline means that voters, particularly affluent voters, will be shifting back to urban areas. The New York Times ran an opinion piece this weekend by Kevin Baker called How the G.O.P. became the Anti-Urban Party. He makes the following assertion, which I largely agree with. The Republican refusal to contest the cities has left them in a permanently defensive stance in national campaigns. This can’t continue. The courts have already struck down many voter suppression laws, and the party’s 2008 presidential results read like an actuarial table, with Republicans increasing their percentage of the vote mainly in aging districts that are losing population. In the meantime, as urban areas continue to grow, they become more and more intertwined with what were once distant suburbs, making “urban” issues all the more pertinent to everyone. The old antagonisms between cities and suburbs will give way to cooperation over everything from where to build the next airport to how to combine municipal services to how to spread the wealth cities generate. And for that matter, over half of all minorities in metropolitan areas — including African-Americans — do not live in the inner city but in surrounding suburbs. I see those changes starting to happen at the local level. An understanding of just how terrible the public's return on investment is for infrastructure spending should be a uniting force. As a final note, we are a 501(c) non-profit. I doubt anyone would confuse this particular blog post with advocacy for one candidate over the other, but just in case, Strong Towns does not endorse any political party or candidate. In fact, I am certain that, in races where we have the opportunity to vote for the same person (President and Senate being the two that come to mind), our staff and board will be splitting votes across all candidates and parties. That's just how we are.